ABOVE: An electric Montmartrobus. INSET BELOW: A single-journey T+ ticket for use on the bus or Métro. Important: T+ tickets allow transfers between buses and trams, but not between buses or trams and Métro or RER lines. Tickets sold by bus drivers (which are marked "sans correspondences") can be used only on surface transportation (i.e., buses and trams). For current information on tickets and transfers, see the RATP's T+ Tickets page. A carnet is a stack of 10 T+ tickets that you can buy at any Métro station and from most tabacs (shops and other locations that sell cigarettes). It costs €14,90, which means you'll save quite a bit of money on every ride. 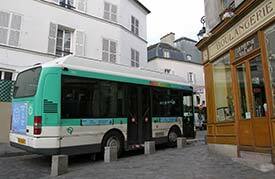 The Paris Visite pass gives unlimited access to RATP buses, the Métro, RER and SNCF suburban trains, the Montmartre Funicular, trams, and the Optile bus network for 1, 2, 3, or 5 days. Adult fares depend on the number of days and zones. (Children's Paris Visite tickets are half price.) Paris Visite also entitles you to discounts of 20 cent or more on some Parisian tours and attractions. You can buy Paris Visite online and pick it up at one of several redemption points in Paris, or--more conveniently--you can purchase it at a Métro, RER, or SNCF railway station or at the airport upon your arrival. Please note that only the higher-priced "Paris + suburb + airports" version of Paris Visite covers airport transportation. Which offers the best value, a carnet or Paris Visite? That's something you'll have to calculate for yourself, based on how frequently you'll use public transportation and where you plan to go in the Paris region. Children under age 4 travel free on buses, trams, or the Métro Kids from ages 4-10 pay the full adult fare for single tickets, but a children's carnet of 10 tickets is half price, so it pays to plan ahead.